Most people set out to trap a coyote because the animal is creating problems with livestock. Beyond the nuisance aspect, there is no need to eradicate the coyote population around your area. Coyotes keep other animal numbers in check, and can significantly reduce the number of deer leaping out into the roadways, hence saving people from hitting them with cars! Click here for my 2013 nationwide list of 100's of professional coyote trappers! How much does coyote removal cost? - get the lowdown on prices. Are Coyotes Dangerous? - sometimes to pets, never to people. How to get rid of coyotes - my main coyote removal info guide. 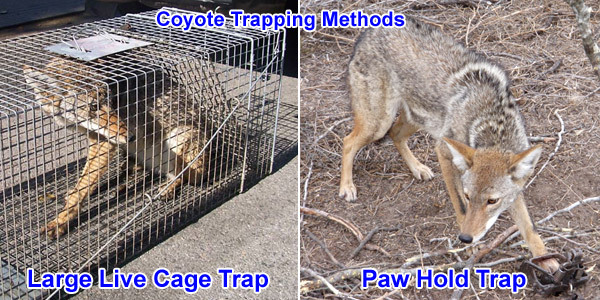 If you do need to trap a coyote, there is the traditional method of leghold or foothold traps, and the modern method of live-traps. Whether you agree with their usage or not, the fact is that foothold traps are painful—how painful is up for debate. It can be argued that an animal caught in a leghold trap will suffer no more than a frightened animal in a live-trap. Both animals will struggle, and the potential for self-inflicted harm is possible with each method. The main difference is that foothold traps induce pain whereas a live-trap will only result in pain if the animal struggles against it. Foothold traps consist of a central pressure lever surrounded by a pair of jaws. These jaws are usually smooth, though many years ago toothed jaws were used to trap both bears and coyotes. Animal advocates and researchers have since modified the jaw trap to hold the animal with the least amount of damage possible. Some foothold traps are made with rubber jaws instead of metal, again, to prevent undue injury. The jawed traps are set in a depression along a well-travelled coyote track. A metal stake with a chain approximately twelve inches long is hammered into the center of the pit. The foothold trap is secured to the chain and then carefully buried with a mixture of soil, moss, and salt. It is important to keep the area as unaltered as possible or the coyote will be instantly wary. Like most wild animals, coyotes memorize their surroundings and can quickly tell is something is out of place. Live-traps are based on the design of a cage. When the coyote enters the metal enclosure, a trigger system shuts the doors on both side of the trap. The doors cannot be opened again unless it is done from the outside. A coyote will be wary of a box trap, so it is useful to bait the trap for a few days without the pressure triggers set. Once the coyote feels no threat is present and food is readily available, it will enter the trap at will. Tips for placing sets have to do with the behavior of the coyote itself. A problem coyote, one that is doing damage to a herd or flock, will return to the scene of the crime. Setting traps around the outskirts of a pasture will increase the likelihood of catching the coyote and not a stray sheep. Traps should also be placed in an open area, preferably one where the coyote tracks show frequent use. A trap set in too close of quarters will be suspicious, and once a coyote is fearful of a trap, it will be that much more difficult to catch it. The bait in your trap should be odorous, and the trap should be set so the wind is able to carry the smell across a wide expanse. A trap set in a thickly wooded area will be less likely to lure a coyote any distance away. Knowing the land you are trapping on is always helpful. Coyotes will frequent the same areas, and knowledge of the landscape will indicate where they are most likely to be. Coyotes like hills, wide, open fields, and isolated groves surrounded by fields. If you’ve noticed a pattern; you’re correct. A coyote wants a clear path of sight for as long a distance as possible. Lastly, make sure you are as scent-free as possible when you set your coyote trap. Moisture and heat compound odors, so if you are setting your trap in the middle of a balmy, summer day, you should wear gloves and other scent cover. Remember, once the coyote catches on to your tricks, he will forever be more difficult—if not impossible—to catch. AAAnimalControl.com is written by me, David. I am a professional nuisance wildlife control operator. It is my goal to provide education about safe, responsible & effective solutions to human-wildlife conflicts. I provide a lot of "how-to" info, but in many cases, wildlife removal is complex, dangerous, and subject to local laws. Sometimes I recommend hiring a professional. I have spent over 10 years now training and investigating companies all over the United States, serving over 650 USA cities and towns. I believe my hand-picked list is far better than what you'll find on a standard web search by yourself. For my recommendation of a local critter trapper in your area, click here for my nationwide list of 100's of professional wildlife control experts. You can also read about Beaver Control & Removal.